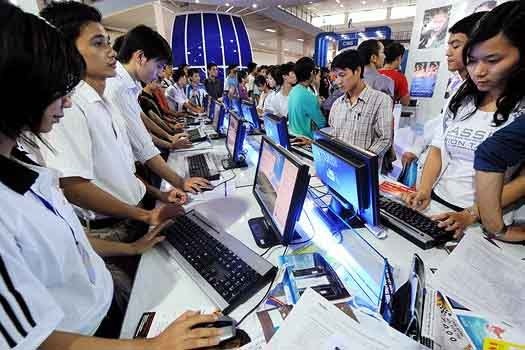 According to a recent report by the Internet World Stats, Vietnam is ranked within the top 20 countries with the highest number of Internet users. Coming in 17th Place, Vietnam accounted for 45 million Internet users in 2015. This is equal to 48.3 percent of the country’s population. In the report, China came in at top with 674 million Internet users. It was followed by India with 354 million Internet Users, and the US with 280.7 million Internet users. The reason for Vietnam being ranked so high is due to several factors. First off, it is one of the fastest growing markets for social media platform Facebook. Second, Mobile data is very affordable with plans starting at $3 a gig. Third, the Vietnamese government is accepting social media platforms as a legitimate way for businesses to find new customers. This was emphasized by Prime Minister Nguyen Tan Dung in January of this year. Since then, government officials have been active on the site. Just recently, the Vietnam National Administration of Tourism decided it will be launching tourism campaigns using the internet to draw foreigners in. From this, they will be saving costs and broadening their market. This is similar to the strategy described by Mr. Ahman Sya from the Ministry of Tourism in Indonesia. The report shows that Vietnam reflected rapid Internet growth from diverse connectivity services. Telecom providers allow flexible bandwidth plans to households and organisations. Thus increasing the opportunity for people to be connected.